Tap Tap Revenge for iPhone | OhGizmo! I have spent every day since the iTunes App Store launched fighting with iTunes tech support to get them to believe the fact that I couldn’t download anything from anywhere in the store wasn’t related to the amount of traffic the store was getting with the new iPhone. It seems that wait until later and try again was the best answer they could give me for 3 days until someone finally bothered to actually check my account and fixed it within 5 minutes. With my account fixed I downloaded all sorts of cool apps today including the free game called Tap Tap Revenge. The game is sort of along the lines of Guitar Hero, but with tracks nowhere near as good. 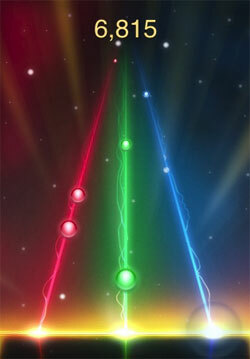 The game has a red, blue and green beams that have orbs of light and the occasional arrow that slide down them. The object of the game is to tap the orbs as the hit the bottom like you would do in guitar Hero. Several different tracks are offered, all with a techno beat by DJ someone or another. The game is a lot of fun though, especially for a free game. The tracks get much harder as you move from easy to extreme difficulties and you can even play a two player game against an opponent. If you want a new game for your iPhone without having to fork over $9.99, Tap Tap Revenge is a really cool one. I got this on my Jailbroken iPhone. Its great. But from that picture it looks a lot more pretty than that of my jailbroken one. When downloading FREE apps do you need an itunes account?